Yes, they do exist. Restaurants that do not want to prepare a vegan menu. I have yet to encounter a sign on a restaurant’s door that explicitly says so, but there are certainly chefs and many in the catering bussiness who share this view. Over the years, I have contacted dozens of restaurants with the question if they can make us a vegan menu. I have had many positive replies, but onfortunately also many restaurants letting me know they cannot or will not make a vegan menu. Sometimes it’s just a straightforward and simple ‘no we don’t do that‘. Sometimes they add some explanation like ‘it’s not our specialty‘, ‘we don’t work with such products‘ or ‘we don’t think we can give you a satisfying culinary experience‘ or even ‘because it requires a total reorganisation of our kitchen‘. Sometimes they even refer me to vegan friendly places in town. I appreciate restaurants taking the time to reply to my request, even if they answer they cannot or will not provide a vegan menu. Rather they are honest about it, than ending up being served an inspiration less bowl of lettuce with tomatoes and fries. 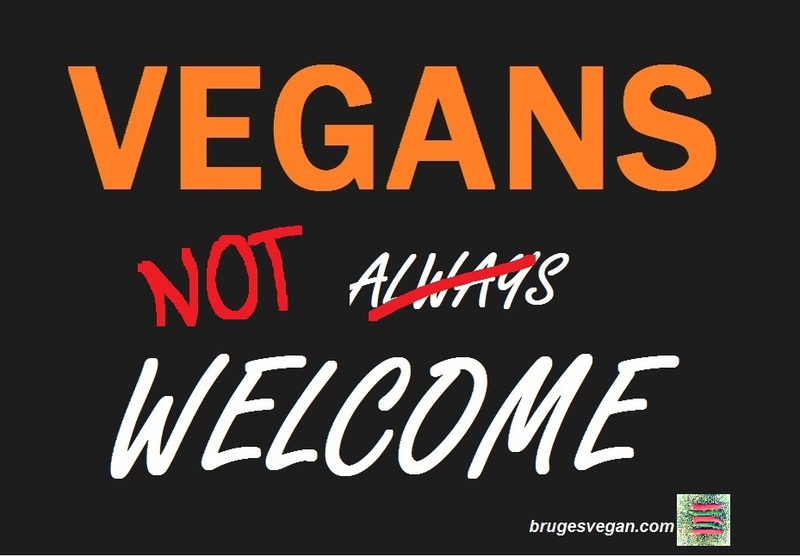 Or worse, saying vegans are welcome but then secretly or unknowingly add animal ingredients to a ‘vegan’ dish. And honestly, I’d rather not visit some places like steak or grill houses at all. Although I do think that vegans should speak out as much as they can and let the catering business know they are out there, so vegan options can increase. If nobody ever asks, things certainly will not change. It is a pity some restaurants do not reply at all (even some restaurants that at first glance seem to be vegan friendly). Their loss, because without a reply, I am in no hurry to go check them out or recommend them to friends. Rather they are honest about it, than ending up being served an inspiration less bowl of lettuce with tomatoes and fries. Or even worse, secretly or unknowingly adding animal ingredients to a ‘vegan’ dish. There are two lists with restaurants on my blog, one with restaurants in Bruges and one with restaurants outside Bruges. 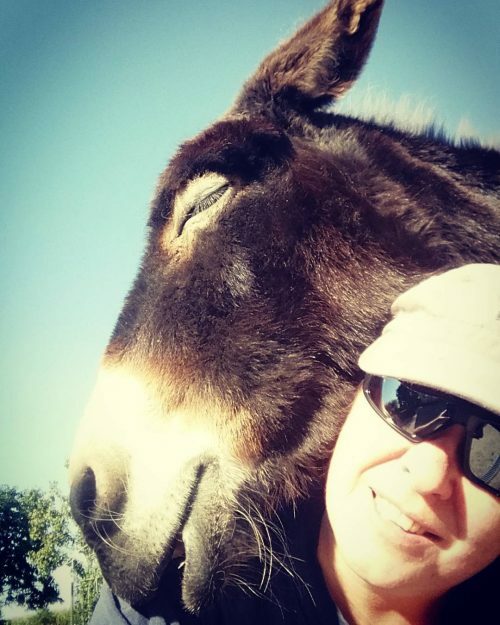 On both pages, I include restaurants that have answered positively, but I also list those restaurants that have said they cannot or will not make a vegan menu, or have not replied at all (see at the bottom of those pages). Some people may find this odd, but I feel it is important to also include those restaurants that have replied negatively. Not only for pragmatic reasons (to remind myself which ones I have already contacted) but also to notify others of their unwillingness to cater for vegans. And I also list the restaurants that have not replied at all – despite numerous e-mails. Even if those restaurants probably have vegan options, and even if I have seen reports about it on social media. If they do not have the courtesy to reply, they do not end up on top of my ‘to visit’ list. Their unwillingness to reply in writing (even if others have reportedly had a vegan meal there), also makes me wary of their ‘vegan friendliness’. As you can see on both restaurant pages on my blog, there are quite a few restaurants that have replied negatively, or not replied at all. Hopefully over the years, these restaurants will feel and realise that they are missing out on customers. When dining out with family and friends, or for work, it is often the vegans of the group that will determine the choice of restaurant. Not necessarily choosing an all vegan place, but at least a place where vegans can get a decent vegan option. A place where the chef is happily thinking outside the box, and creates a varied and culinary exciting vegan menu. In the end, as the numbers of vegans are increasing, catering businesses that leave vegans at the door will experience that, figuratively and literally, it’s their loss. 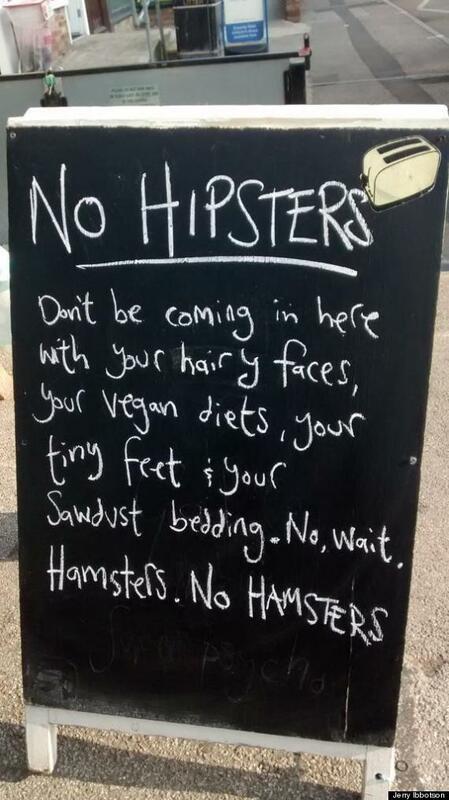 Credit: the NO HIPSTERS Café sign is reportedly taken by Jerry Ibbotson and is from outside The Pig and Pastry Café in York (UK). See this article in Huffington Post. See also my post ‘A word or two about our restaurant reviews‘. I really appreciate your efforts and your lists. I wish there were such lists for all cities! Wow. I had no idea. This is dreadful that a chef cannot make a simple tasty vegan meal. Indeed. Any self-respecting chef should be able to make a vegan meal with the fresh ingredients (vegs, nuts, pasta, rice, etc) at hand in his kitchen. How rude! I have yet to experience this, but I guess these restaurants don’t want our money! Oh well, we shall unite and eat else where 🙂 – great post!